Teri could conceivably stand pat with returning Bears and current commits and still be able to put together top 3 to 5 relays across the board. An NCAA championship team generally needs 450 points to win and that roughly pencils out to top 3 finishes in all relays and and A and B scorer in every swimming event. Multiple scorers are not likely in breast or distance, but can make some of that up in fly (Maddie, Cassidy, Elise). KB3 could add some punch in back and the best of Ali, Ema, or Zoie could move Abbey into her natural sprint hammer slot on medley relays. Abbey/Izzy/Maddie hold down three legs on the 200/400 Free Relays. For sure Robin could be used on the 400, not clear on the 200. Alex Crisera could be useful on both relays. Robin and Izzy can swim legs on the 800 Free Relay. Could also add Abbey, Darcel, or Keaton. Maybe Chenoa. Abbey and Izzy could swim all five relays, but more useful as 3 individual/4 relay swimmers. Mary Smutny could help on the 800 along with middle distance. Lots of really good options thanks to Teri's eye toward versatility. 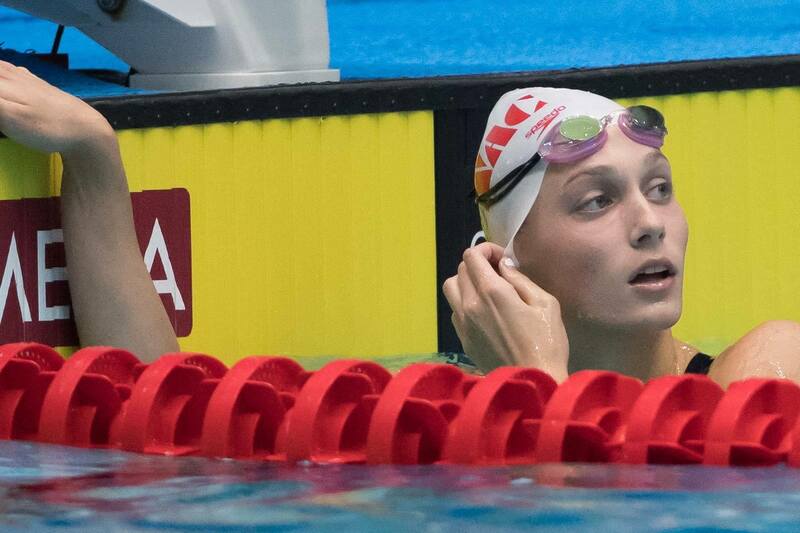 I recall someone in the 2018 thread mentioning that Kate D. swam fly on the 200 med relay in Knoxville with a 23.69, so if we do get her, not only would we be putting her breast/free/IM skills to work, but potentially fly as well. The Bears' flare is kept strictly to the water, as they are swimmers built on a foundation of humility yet, they have a roster full of superstars. "They kind of have that instilled in them already, just the way they grew up and the types of people they are," Dunleavy said. "(Those are) the kind of the people we look at when we recruit, not just people with fast times." Just a little observation related to the Daily Cal article and pertaining to the value the women's team places on humility- I was at the Cal-Arizona meet. I was really impressed with the Cal swimmers, especially Amy Bilquist, in how they made a point to show their gratitude to the Cal Band for showing up. Amy, in particular, thanked each member of the band as the band was leaving. I loved seeing some of the greatest swimmers/athletes in the world taking the time to notice that the Cal band didn't have to be there. For me, that display of humility makes it so much more fun to cheer on the Cal women's swim team. I've been quite a bit behind on this, and I sincerely apologize. It's been a busy past two weeks, but I wanted to provide some quick updates on recruiting. Apologies in advance also, it's pretty long as well. High school champs are underway in Texas, with the regional meets wrapped up yesterday, and state the weekend of Feb. 16th. Attached are the links to see which of our recruits qualified for the 6A meet (big schools). I'm still waiting on the links to the 5A meet. The way that HS State is seeded: there are 8 regions in Texas. The top two swimmers in each event in the A-final are automatic qualifiers for State. From there, the next 8 fastest swimmers from all 8 regions are essentially "called up" to the meet. 1. Ella Collins (Austin Swim Club): She swam a 1:46.83 in the 200 free. Leads everyone going into state. I would say that I have her on my list, in addition to the in-staters that we have been frequently talking about. 2. Sydney Stanford/Beth McNeese (Cy-Fair Swimming/Katy Aquatics): I'm going to talk about them both at the same time, given that they're from the same region. -Sydney's last name is a non-starter, according to UAC, but she has lots of upside potential. Won the 100 free as well in addition to her 200 victory. -Beth took second in both the 200 and 500, the 200 is her second fastest recorded time ever, I think. -Both aren't very high profiled, nor do they rank very high in both Texas and Nationally, but I think with development they could be key players to any team in the future. 3. Emma Stephenson (Dad's Club): She's one of the members of the "Emma-cubed" trio (Emma Carlton and Emma Sticklen being the others). She swam a solid 50 free/100 fly, the latter having her seeded as #2 behind Sticklen. Also seeded #2 I think in the 50. 4. Emma Wheal (Western Hills): Seeded #3 in the 50 free, but managed to make the 100 free callups list. Solid times overall, was a medalist in both these events last year at state. 2. Hannah Bellina (Pearland): Her sister, Jaden, swims for Auburn. However, brings in a very intriguing set order of the 200/500 free. Solid times as well, she is a repeat state qualifier. 3. Valerie Ann Staffeldt (The Woodlands): Her primary events are the 50/100 free. Seeded #1 in the 50, and #5 in the 100. Was part of the state medalist 200 medley/free relays last year as well. A bit ways off, but a 2021 recruit I want to introduce is Ana Herceg, from the Austin area (Nitro). She swims in the 5A meet (I think), so I don't have any of her times readily available. However, reports are that she did blast a 1:49 point 200 yard freestyle, and she's only 14! Her development is similar to that of 2018 Louisville commit Diana Dunn, who went a 1:50 high when she was 13. 1. Cora Dupre: Bearz012 and I have discussed her a bit ever since someone shared the Texas unofficial visit pic in the thread. Swims club for Mason Manta Rays (Fosters + Ashley Volpenhein). We understand that Texas is on her radar, and probs the Furd (Ashley), Tennessee (Hannah Foster), and maybe some other sprint-inclined school that will cater to her needs, which is primarily sprint (22.51/49.53) and back/fly (54.83/55.92). 3. Olwyn Bartis: SwimMAC (Thleen). Incredible range of freestyle (think Drew Kibler, Trey Freeman on the men's side). In the event that we do get her, I think it eliminates the immediate need for Ella Ristic in 2020 as Olwyn herself would be a decent replacement for Chenoa with the exception of the non-CS reported 1650/1000 (holds times of 22.78/49.44/1:46.39/4:46.31 50-500). 4. Ashley Turak: From Michigan, I would like to be inclined to say that she's on Mike Bottom's radar. I don't know much about her, but if we can pull her in, with a bit of further development heck she may as well be the next Maddie Murphy sans fly skills. Solid sprinter (22.38/49.79 free), which is pretty much all she can do, but brings in lots of value. 6. Ashley McCauley: Ashley hails from Marlins of Raleigh in NC. She's primarily attributed to as a breaststroker, with IM talent attached to her. 200 breast champ in Knoxville (2:09.54), and her club teammate/bff is Maddie Homovich, UGA commit (2018). I think she was either a National Junior Team member at some point, or on the 2015 Jr. Worlds squad, but I could be wrong. 7. Gabrielle Dang (no, not related to 2020 recruit Ethan): Gabby is a sprinter of sorts. She hails from Bellevue Club Swim Team, in Bothell, WA. Primarily a sprint freestyler through the 200 (22.90/49.85/1:49.46). Also excels at the 100 fly (52.77). She attended National Select Camp this past fall as well. Hailing from WA state, I think she's friends with Emma Carlton, TAMU commit, and the duo of Jon Cook and Daniel Roy, Furd commits on the men's side. 8. Madelyn Flickinger (not related to UGA pro Hali): She hails from SwimMAC Carolina, home club of Thleen, if that's any encouragement at all. Strongest event looks to be her 100 free, 49.81 leading off the 400FRR in Knoxville. Solid backstrokes (54.27/1:56.98), and Winter Jrs cuts in the 200 breast and both IMs. 9. Mackenzie Degn: She comes from NOVA, home club of Courtney Mykkanen. Her high school team, Santa Margarita, had Katie McL and Furd star Grant Shoults, not to mention Ella Ristic (2020), Isabelle Odgers (2018 $C commit), and Samantha Shelton (2018 Harvard commit). Her best times in her best events, 50/100/200 free, were all achieved at the CIF State meet back in May of last year (22.95/49.91/1:49.13). 10. Kaitlyn Dobler (2020): bearz012 pointed her out to me.Kaitlyn looks like a great 2020 recruit: #1 OR, #9 Nat. Primarily a breaststroker (1:00.5/2:11.4), has a more than decent 50 free (22.8). Keeks is partially from Oregon, so that's the only connection I know of. We may not be in need of more breaststrokers by then, but she also has a high improvement curve (all best times done quite recently). Think (edit: corrected spelling of Zoie's surname lol) Hartman may have already taken an unofficial visit to 'SC tho? Trojanettes are definitely one of the frontrunners for her, being "Breaststroke U" and all that (no comment here re their now retired pro group *cough*). Wouldn't be such a great outcome for us, TBH. Anyway, other contenders for Hartman's commitment may include UT & UGA. Feel that chances of Zoie going to LSJU would be lower than to 'SC...reasons as noted by bearz012. I'm sure a slew of other schools are actively (unofficially of course hehe) pursuing talented & versatile Zoie, including but not limited to UVa, NCS, Michigan, the 2 Arizonas, Ohio State, etc. When the starting buzzer sounded, Berkoff exploded off the block into her powerful underwater start. As she streamlined below the surface, she exerted forceful dolphin kicks. She was the last to break the surface, in similar fashion to her Olympic gold medal-winning father, David Berkoff. But come this fall, the Berkoff siblings won't be practicing in the same lane. Cale heads to Minnesota for his freshman season as a Golden Gopher in August while Katharine prepares for her junior year at Hellgate. Her brother is going to Minnesota, so there's that connection. Another thing to take note of - her spectacular underwaters, which will surely be beneficial in NCAA swimming. Nice article find bearz012! I'm even more sold than before. I^2, CC, KB3, and either Smutney or Hickman. Kate Douglass: I don't think I ever had any inclinations of her coming here, but rather her staying on the East Coast, where it would better fit her, hence my inclinations of her leaning towards UVA/UNC. 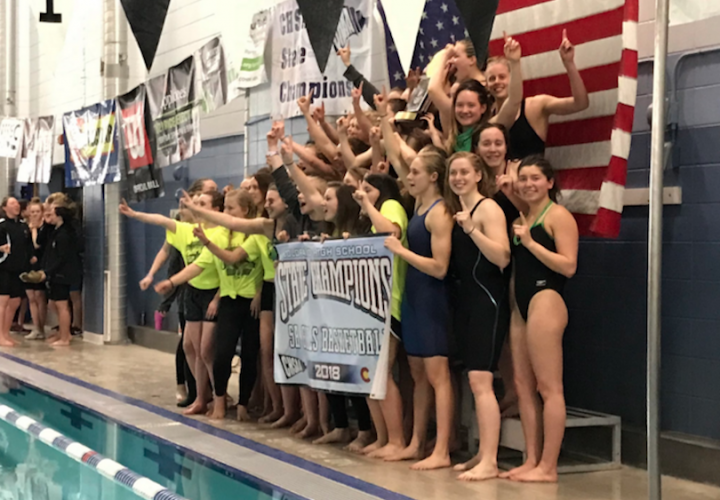 However, things have proven otherwise, because an entire slew of $C swimmers followed her on insta recently: Abby Miller, Tatum Wade, Lily Dubroff, Caitlin Tycz, Kirsten Vose, Louise Hansson, Piper Brockley, Hanni Leach, and Jake Sannem and Carsten Vissering on the men's side. In return, she's following Louise Hansson, Abby Miller, Caitlin Tycz, Jake Sannem, and Lily Dubroff. Oddly enough, the Irvine Novaquatics club team's official insta also followed her (Ayla, 2019; Ella R., 2020). Zoie Hartman: Well apparently $C is Breaststroke U, in terms of how much success they've had. I'm assuming she must have visited SoCal recently as well, because now she's following Riley Scott, Kirsten Vose, Louise Hansson, Tatum Wade, Hanni Leach, Lily Dubroff, Catherine Sanchez, Piper Brockley, Abby Miller, all of whom follow her back, in addition to being mutuals with the $C swim account on insta. Also, they apparently have 12 swimmers graduating spring 2019, along with two divers (thanks for the stats, UAC!). Even as a private school, they now have quite a bit of money to give away, albeit some may not be on the athletic scholarship. Kat Berkoff: So apparently lady trojan Hanni Leach, $C c/o 2019, is not only from Missoula, but also from Hellgate, Kat's high school. I mean, I'm not quite sure of Salo's record with backstrokers, but *sigh* I guess $C is also a main target for KB number 3 as well. 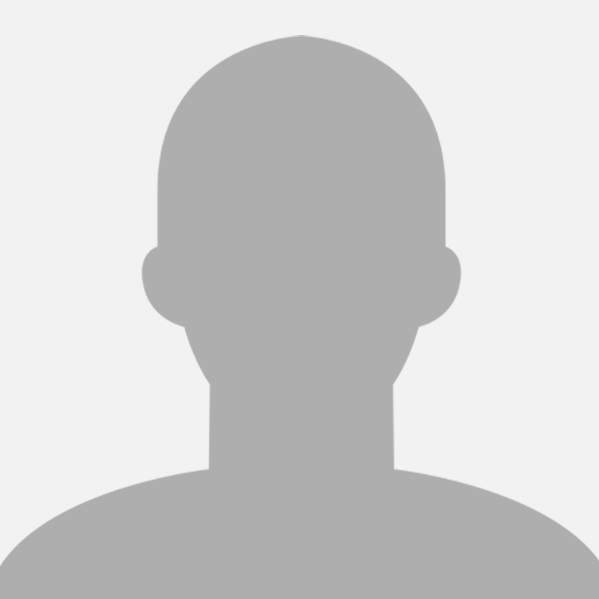 Also would like to note that Kate D. has also followed a number of UVA swimmers, including Jen Marrkand, Erin Earley, Kyla Valls, Emma Seiberlich, Morgan Hill, and Maddy Vonderhaar. So, I'm assuming UVA, $C are the notable ones on her radar. UPDATE: if you click this link, vsco.co/katedouglass, the pics at the front are the most recent. The UVA famous building thing is at the top of the first page. To further answer your questions, it does indeed look like yes, she made a visit to the Wahoos. Ella taking on a brutal double, and I reckon that Gretchen & Alex will probably win the 50 and 200 free, respectively, as they are seeded much lower than their PBs. Zephanie Koh is also a really good 200 flyer, just a tad slower than Mary Smutny's class-best 200 fly time. Her sprint fly could use a bit more work, but solid nevertheless. Her 100 back is quite developmental, dropping 4 seconds from Dec. 2016. Seems like Alex Cisera would be a great in-state get. Can always use another pure sprinter (50/100) for the 200/400 Relays, especially if a substitute breast leg on medley relays for Abbey doesn't emerge/get added. Actually I've been most impressed by Isabel Ivey who's really on fire @ this meet, and dropping time like crazy! 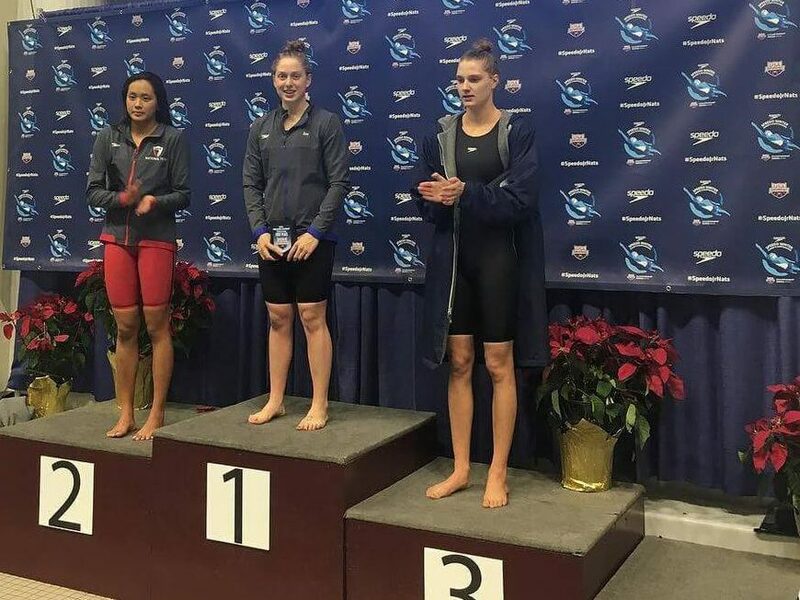 Isabel was also the fastest American in the 200 free A final yesterday, dropping over a second from her pre-Jr Pan Pacs PB to come in 3rd in 1:58.94. Actually would have ranked 9th at OT morning heats in this event with that time - faster than Gibson/Manuel/Drabot/Bispo/Chenault and even (a still-recovering) Katie McL's prelims swims at trials! Caitlin: Two of my favorites! These two killed it in the fly events this week and it has been really fun to play a smart part in their journey. Last day of #jrpanpacs in Maui! Kaitlynn: "I am so excited to announce my verbal commitment to University of Kentucky to continue my athletic and academic career in 2019! Thank you to everyone who supported me throughout the years! I can't wait to be a part of the Wildcat family! #GOCATS"
Is she of relation to 2018 UofL commit/2021 recruits Kaylee and Krista Wheeler (cousins)? Probably not - she's from Illinois and Kaylee is from Kentucky, I believe. Don't trust me on this one, I could be 100% wrong. The reason why I didn't put Kate Douglass on the list is because I'm not sure she's even looking at Cal. I'm thinking she's a UVA lean ... where former NC State coach Todd Desorbo has been recruiting a bunch of sprinters and doing well with their current sprinters. Maddie Donohoe seems to be looking at UVA. She's good friends with Kate Douglass, so that may affect her decision making. Kate Douglass: I don't think I ever had any inclinations of her coming here, but rather her staying on the East Coast, where it would better fit her, hence my inclinations of her leaning towards UVA/UNC. Also would like to note that Kate D. has also followed a number of UVA swimmers, including Jen Marrkand, Erin Earley, Kyla Valls, Emma Seiberlich, Morgan Hill, and Maddy Vonderhaar. So, I'm assuming UVA, $C are the notable ones on her radar..
Charlotte Catholic's return to 3A competition ended in victory for their women's team, as they took first with 298 points. Last year's champions Marvin Ridge finished second with 240 points, with the East Chapel Hill women finishing third with 197 points. Charlotte Catholic continued winning, as Olwyn Bartis was victorious in the 200 free in a 1:48.64. Anna Durak of Hickory joined Bartis under 1:50 with a 1:49.81, while Marvin Ridge's Ellie Vannote took third in a 1:50.06. T.C. Roberson's Grace Reeder won the women's 200 IM, storming home in a 28.62 to overtake Weddington's Maddy Flickinger for the gold. Reeder finished with a 2:04.51 to Flickinger's 2:04.81. East Chapel Hill's Sydney Morgan (2:05.55) was third. Bartis won her second event of the evening in the 100 free, as the sole woman under 51 seconds with a time of 50.69. Weddington's Corbi couldn't repeat as champion, but placed second with a 51.37. Charlotte Catholic put up two swimmers on the podium, as Bartis was joined by teammate Stout who took third. Weddington was victorious in the 200 free relay, just edging out Charlotte Catholic by three tenths. The team of Flickinger, Amelia Kudela, Kelsey Tolchin, and Corbi finished with a 1:36.15 to Catholic's 1:36.45. Marvin Ridge took third with a 1:37.91. Charlotte Catholic won their second relay of the day in the 400 free relay, touching two seconds ahead of the field in a 3:28.43. Julia Menkhaus finished her senior season four-for-four in state championships, as she led the team out in 51.50. Teammates Victoria Dichak, Madeline Menkhaus, and Bartis helped Julia reach this accomplishment. Bartis's split of 50.60 was the fastest in the field. Weddington placed second with a 3:30.67, with Marvin Ridge (3:34.24) finishing third. The Harpeth Hall girls broke the national overall high school record tonight at the TISCA HS Championships in the 200 medley relay. With Alex Walsh and Gretchen Walsh bookending the relay, along with Ella Nelson and Alex Massey, the girls took down both the national independent high school record (private schools) that was previously held by Sacred Heart Academy in Kentucky, along with the overall national record, which was held by an incredible quartet of girls from Carmel High School in Indiana. 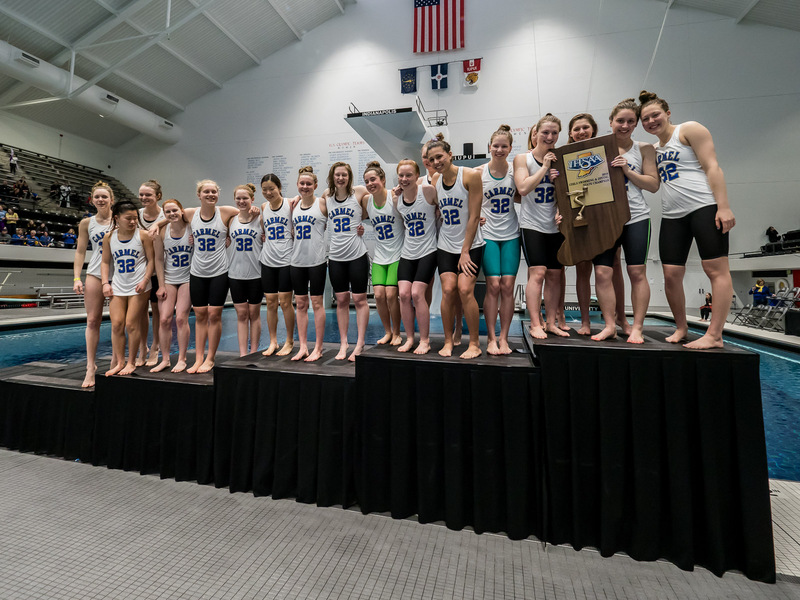 Harpeth Hall went 1:38.77, faster than the 1:39.25 done by Carmel in February of 2015 as well as the 1:40.61 done by Sacred Heart in February of 2016. Alex Walsh's 24.37 lead-off backstroke leg was the clear standout leg for Harpeth Hall, over a second ahead of both Sacred Heart's and Carmel's lead-offs. Alex Walsh was 24.37 leading off Harpeth Hall's 200 medley relay, followed by Ella Nelson's 28.27, Alex Massey's 24.49, and Gretchen Walsh's 21.64 to go 1:38.77 and break Carmel's overall record and beat Sacred Heart's independent record. Alex Walsh was back the very next event to win the 200 free (1:45.93), and then Nelson held off Brentwood Academy's Allie Raab in the 200 IM, 1:58.31 and 1:58.56. Gretchen Walsh was back in the 50 free, taking the title in 22.26 over her Harpeth Hall teammate Ophelia Pilkinton (22.85). In the final girls' race of the night, Riley Gaines of Station Camp went 54.16 in the 100 fly to touch out Harpeth Hall's Alex Massey (54.28). Bayley Stewart, Zoe Bartel, Coleen Gillilan, and Kylee Alons combined for a 1:38.13, more than half a second faster than the 1:38.77 done by Harpeth Hall last night at the TISCA Champs. Bartel had a great 27.43 split and Gillilan was very strong with her 23.43 split, too, as the middle 100 was the difference-maker for Fossil Ridge. They take down Carmel's public high school record, and while Harpeth Hall lost the overall record, they still own the independent record. Gillilan, the only non-senior on the record setting relay, rode the momentum. The junior won the 200 freestyle in 1:46.98. Chatfield freshman Kathryn Shanley was second in 1:52.16 and Fairview junior Mikayla Seigal finished third (1:52.60). Gillian returned for another impressive, dominant performance in the 100 butterfly- finishing in 52.57. Mountain Vista's Natalie Arky (55.67) and Gillilan's sophomore teammate Caraline Baker (55.85) rounded out the podium. Kelly Pash went a 1:45.65 to earn the 200 freestyle top spot for Carmel. Kay Foley (1:47.68) of Munster, and Northridge freshman Elsa Fretz (1:48.09) follow. Pash is well ahead in the 100 free after a 48.87 tonight. Fretz (50.10) took second in prelims. Foely posted a 4:48.02 in the 500 freestyle tonight. Pash went two for two on state titles, running away with the 200 free. The junior touched in 1:45.50, less than a half second shy of Claire Adams' state record. Northridge freshman Elsa Fretz finished second in 1:47.52 and third place went to Munster's Kay Foley in 1:48.09. Pash picked up her third gold meal of the afternoon when she touched the wall in 48.59, over a second ahead of second place finisher Fretz in 49.64. Pash finished two tenths shy of Amy Bilquist's state record, a 48.36. With Pash having a season left, and Fretz only a freshman, that record could be in jeopardy in the coming seasons. Northridge led the way through prelims and had just enough to hold on for the win in finals. Fretz (22.95), Kenzie Weber (24.39), Jenna Nethercutt (23.69), and Lauren Miller (23.05) touched in 1:34.07 for the state title. Carmel dropped four tenths from prelims but Pangburn (23.61), Colleen Duffy (23.92), Avery Williams (23.25), and Alyssa Conley's (23.50) 1:34.28 wasn't quite enough as the team finished second. On the 2nd night of the 2018 TISCA Championships, Harpeth Hall's Alex Walsh and Baylor School's Trey Freeman stole the show again. 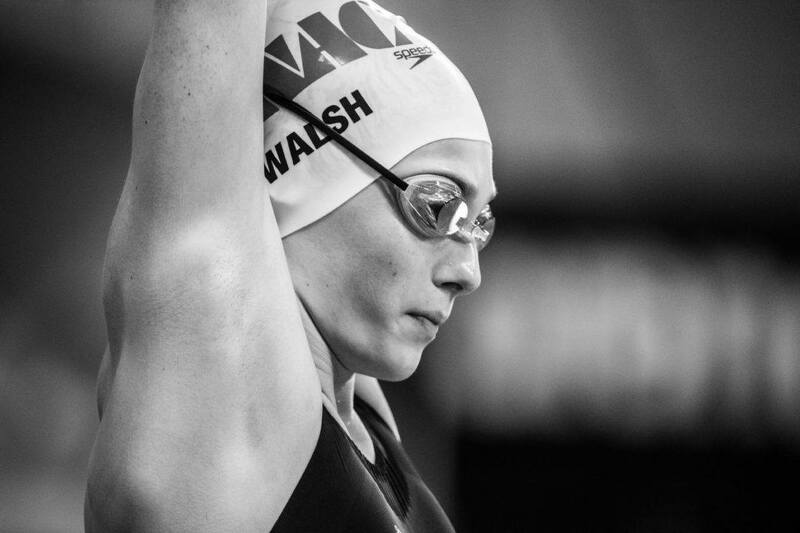 Walsh, who was part of a national high school record last night and won the 200 free shortly after, swam a 58.88 to win the 100 breast tonight. 2nd was Allie Raab of Brentwood Academy in 1:01.22. Walsh also anchored Harpeth Hall's 400 free relay with a 48.78 the relay won the meet in 3:22.47. Harpeth Hall also won the 200 free relay in 1:31.38, powered by Alex Walsh's sister Gretchen Walsh's 21.68 anchor leg. Gretchen Walsh also won the 100 backstroke in a best time of 52.85, a marked improvement from her 54.25 previous PR done in December at Winter Junior Champs. Ophelia Pilkinton was yet another winner for Harpeth Hall, going 50.05 to take the 100 free. Harpeth Hall girls and Baylor School boys are the 2018 TISCA team champions. The records kept rolling into the 100 freestyle where Katharine Berkoff, a junior at Hellgate, touched in 50.01 for first. The Hellgate team (names were not available) took down the state mark in the 200 free relay with a 1:38.54. Berkoff kept rolling, clocking an impressive state record of 52.80 to win the 100 backstroke. Junior teammate Aidan Condit was the only other swimmer under a minute, finishing in 58.33. This was posted a while back, but in the article, it mentions that Regan is now taking classes online. Any idea how that may affect admissions at the Farm? Cheers for the reminder, swimmer19! My (admittedly massively limited) understanding is that LSJU does traditionally frown upon accepting home-schooled student-athletes, at least to a greater extent than other non-Ivies schools. Now as to how much Regan's online classes would be counted as home-schooling by TPTB down on the Farm, and whether Meehan has enough pull with their Admissions Office to make an exception for a recruit who the swimming programme really, really wants... ?? So for now, I'd like to optimistically believe that we may still have a shot with what's likely going to be the #2 recruit of the 2020 class, in spite of her having "shown off" all decked out in Furd sweats. 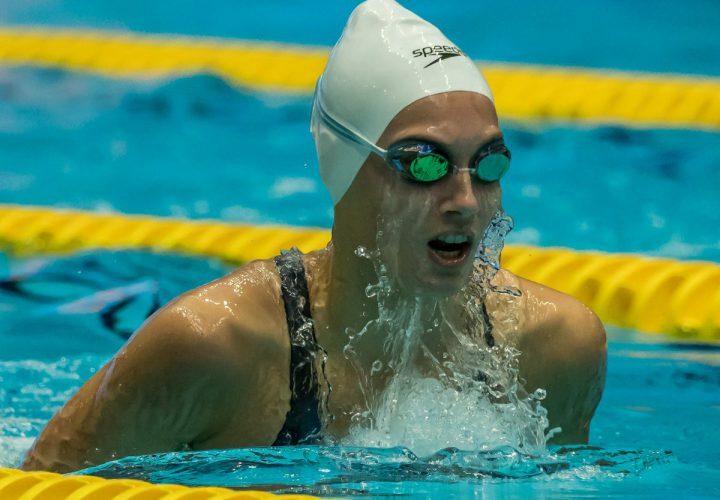 "It took me a couple of days for that to sink in, and (Olympic and World backstroke silver medalist) Kathleen (Baker) and all of my teammates and coaches were really supportive, but I never want that to happen again." Quite different from our original prediction... I remember that she planned to take visits to UVA, UF, FSU, NCS, and here. Anyways, we're at 2-1 on our list of projected recruits. I'm okay with this. We have our butterflyer in Cassidy. KB3 please!